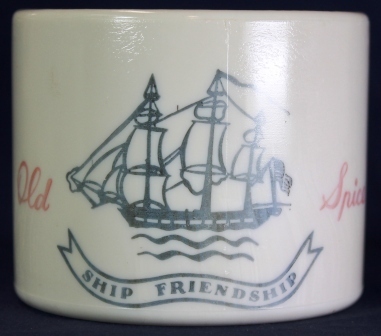 Old Spice Shaving soap in a mug was among the first products produced by Shulton. 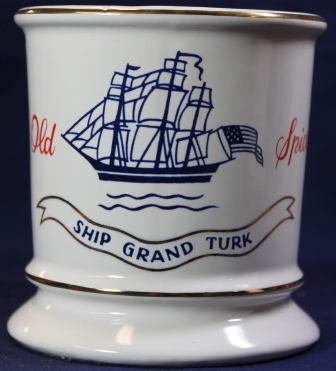 In adopting its "Early American" theme, Shulton selected the Hull Pottery Company, in Crooksville, Ohio, to fashion the fist mugs. These heavy pottery mugs with almost primitive looking graphics were designed to mimic Early American household pottery. The sailing motif added to the masculine Early American feel Shulton was striving for. By the early 1940s, the Old Spice for Men products were so successful, that irregularities with the Hull Pottery (mainly the bottles) slowed down the production lines and caused many bottles to leak through ill-fitting stoppers. Shulton considered using a more uniform product out of molded glass. The Wheaton Glass Company, in Millville, New Jersey, formulated a special milk glass they called "Pottery Glass." It had the heavy look and feel of the Hull Pottery mugs (and bottles) but could be produced faster and with more precision. With slight changes in size, shape and graphics, these glass shaving mugs endured until the early 1990s when Procter & Gamble discontinued the shaving mug and soap product line. 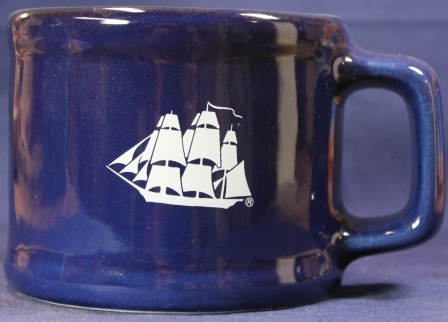 Also included in this section is information on shaving mugs manufactured for the Canadian market, mugs made in Belgium and England, a few other unusual shaving mugs that were used is corporate gifts or premiums (not sold commercially) and several coffee mugs.